Home → Case Study 10: When Kazeem met the Sheikh: More Respiration than Perspiration! On the seventh of August, I went to see Adel at home. At this stage, I was keen to get this process of informing these ‘disciples’ out of the way. From previous evidence. the omen was not good. It was nice to see Adel, with whom I had worked closely in our roles as clinical pharmacists at Southampton General Hospital. Though he was a very close friend of mine, I had tried unsuccessfully to get him interested in any of my project ideas…..
from Chapter 5: How Do You Recruit Disciples? The events I was describing in my book happened many years ago in 2008. So when I visited Adel on Wednesday the 5th of March last year (2014) – over 5 years later – I realised how much things have changed. For one thing, I got lost trying to find his house! Which is evidence enough to say we hardly see one another these days. 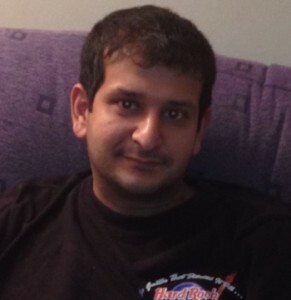 Adel now works for Portsmouth Hospitals NHS Trust. This visit was to catch up on old times and to conduct an interveiw I had been pining for with him. The interview provides an insight into how we got here and on the things that has been exciting his passion in his role as a Antibiotic and Respiratory Pharmacist at Portsmouth. It was a great interview with more respiration than perspiration but really sorry it has taken me the best part of over a year to put it up! As is customary with these interviews, there is an accompanying YouTube video for extra insights. Enjoy. Hello Adel, We worked together as Clinical Pharmacists at Southampton General Hospital may years ago now! How many years? Can you describe your pharmacy career to date and what you do now. In my ‘Doctrine of Universal Truths‘, I observed wryly that ‘…I have tried unsuccessfully to get him interested in any of my project ideas’. When I came to you with the MUR project proposal, why did you say yes? average in 2008 and premature mortality for asthma was over 1.5 times higher. As a senior pharmacist in this area of practice, what are your thoughts on strategies for improving care to patients in this practice area? The DoH produced its outcome strategy for COPD and asthma in England in July 2011. How can pharmacists REACT to the challenges set out in the document? You have been involved in a number of audits and research in respiratory care, are you able to share some of the stark outcomes of these audits and research and provide some references on where to get information to support better care for respiratory patients. How do you balance the challenges of work with family life in you pharmacy household (as Claire is also Pharmacist at University Hospital Southampton NHS FT)? Thank you very much for your time Adel. Extended interview is on our YouTube video.